Today’s archive review (no longer available online with the Nottingham Post, where it first appeared) is one of the handful I’ve done at the Playhouse, which is a great venue for music. I write about plays for the Post occasionally, but never at the Playhouse, as I’m one if its trustees. However, gigs are put on by outside promoters, so I feel free to write about them. 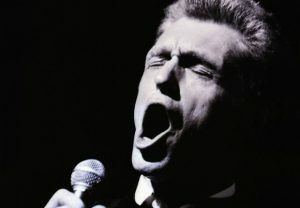 Georgie Fame, 73, is having a welcome resurgence. 6CD set ‘Survival’ provoked positive reassessments of his key 60s work. He was a Nottingham regular back then, playing the Dungeon, Beachcomber and elsewhere. Younger fans will have seen him play with Van Morrison in the late 80s. He still tours extensively. A visit to the Playhouse eighteen months ago proved so successful that he’s made a rapid return. Accompanied by sons, James, on drums, and Tristan on guitar , Fame takes the stage in bright pink trousers, for which he apologises. ‘I feel like a poor imitation of Michael Portillo.’ He talks for ten minutes before opening with a fine rendition of Ray Charles’ ‘I Got A Woman.’ This is an evening of reminiscence as much as music, but all the talk is of music: his influences and the people he’s met along the way. For instance, why he was forced to break up the Blue Flames one day but his drummer had a job with a new band called the Jimi Hendrix Experience the next. Fame, aka Clive Powell, got his silly name from Larry Parnes (as did his old mate, our own Vince Eager, who he’d caught up with the day before). There are good tales about those early days: touring with Eddie Cochran, eighteen months with Billy Fury and how he was added to a tour to fill seats for a quartet of less popular artists: The Supremes, Smokey Robinson, Little Stevie Wonder and Martha and the Vandellas. The stories are lovely and the music is better. Despite severe health problems a few years ago, he’s in fine voice. His playing, on a Hammond organ he bought in 1966, covered top to bottom with stickers, is as lively and distinctive as ever. He plays his biggest hits: Yeah, Yeah; Get Away (‘I don’t call it a song, I call it a pension plan’) and The Ballad of Bonnie and Clyde. The biggest treats are more obscure: B side, like Don’t Send Me Flowers in the Graveyard and another number by Floyd Dixon; a Georgia In My Mind that incorporates half a dozen other southern classics; Goffin and King’s The Point of No Return: all terrific. He concludes two tremendous hours with a sublime take on Mose Allison’s Was. A packed house gives a standing ovation to a legend whose love of live music shines as brightly as it ever did. This entry was posted on Monday, July 30th, 2018 at 11:26 am	and is filed under Song of the Week. You can follow any responses to this entry through the RSS 2.0 feed. You can leave a response, or trackback from your own site.